One of the most surprising aspects of purchasing a new home is the way your furniture can seem to shrink. If you’re coming from an apartment or smaller space, you’ll often find that your new home has more space than you know what to do with, and it can be quite a bit of fun to outfit it with quality furnishings and the entertainment system you always wanted but never had the room for. Dallas homes in particular are often spacious and offer the perfect backdrop for exploring your design tastes. However, things do change and life circumstances may see you needing to convert your home office back into a bedroom. Maybe it’s due to the birth of a new child, a need to house an aging or ill parent, or the return home of an adult child. Whatever the reason, when these life events happen it isn’t that you stop needing an office—you hardly have fewer things to keep track of—it’s just that you have less space to do them in. Custom Dallas home office furniture can help you build a comfortable and productive office somewhere besides a spare room, either by turning a formal dining room into a custom home office, or converting an alcove or nook into a productive office space. Desks: A good solid wood desk does more than provide a place to set your coffee. It’s where you’ll do most of your work. A generous work surface that fits comfortably in the area you have will be vitally important to your productivity. Desks with drawers underneath keep supplies close at hand, and desks with larger drawers can eliminate the need for a separate filing cabinet. Bookcases: Although we’ve made great strides in reducing paper in the office, not everything is available in a convenient digital format, and some jobs require text references or paper records. Bookcases provide storage that is expansive and flexible. Reference books and binders can be easily accessed. Files or other records can be kept on lower shelves in file boxes. Printers and other equipment can also go up on a shelf. Sideboards: Keeping records, documents, and supplies out of sight until they’re needed is crucial to keeping your office neat. 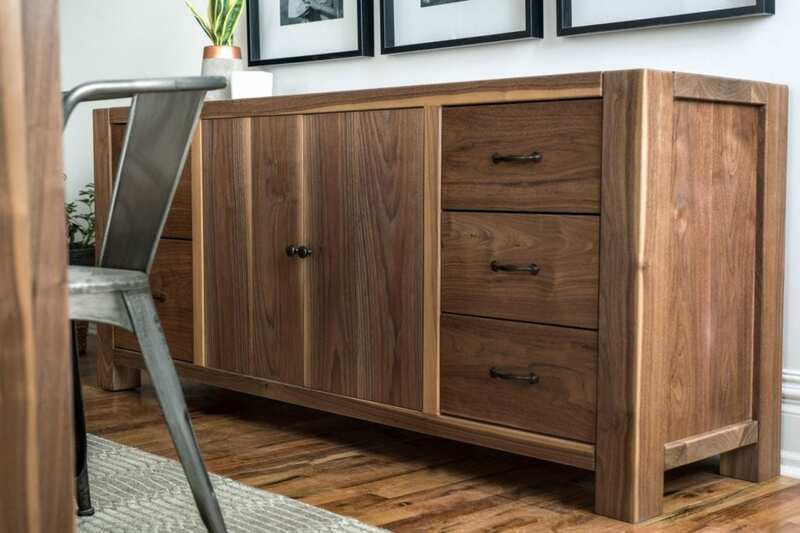 A stylish sideboard provides a handy place to tuck things out of the way and reduce clutter. Sideboards that are finished on both sides can make a handy room divider to separate an office from a larger space. Fortunately, technology has reduced the volume of both paperwork and the equipment that we use to deal with it. This makes creating a home office in a small space much easier, as you won’t have to dedicate as much room to equipment like CRT monitors or paper records that go back many years. That makes small spaces more viable as home offices, and opens up more types of spaces to convert into a home office. A decade ago no one would have considered a bay window in the living room as a viable office, but today, a small desk and a chair can turn it into a productive workplace. There are many other spaces that can be adapted as well, provided you can find the furniture to fit. When furnishing a small office you will want to consider custom home office furniture specially made to fit your available space. Any home office can benefit from custom-made furniture. For example, desks at the perfect height that comfortably hold the computer equipment you need while leaving enough space for you to comfortably jot down notes are hard to come by. Custom home office furniture is especially important in small offices where spaces can be oddly-shaped and all the needed equipment for you to do your work has to fit in somehow. Consider the bay window alcove given as a previous example. It can make a fine home office, but standard home office furniture will fit into it awkwardly, if at all. A fairly standard 60-inch wide desk may not even be able to fit snugly up against one of the walls of the alcove. Sitting in the middle will waste a lot of space that could be used for shelving or storage. If it is a particularly small alcove, then the desk may not fit at all, leaving little choice but to face the desk the wrong way and miss out on the view through the windows. However, a custom desk that is only slightly smaller—at 56 inches, 48 inches, or 44 inches—may squeeze in perfectly and fit snugly against the window, allowing you to appreciate the view as you work. It also has the benefit of leaving other walls open for shelving and sideboards. An alcove like this can also can also be separated from the rest of the room by a console table, bookcase, or even a hutch to create some privacy. The need for customization applies to this other office furniture as well. Mass-produced shelves might not fit along the walls of an alcove, and a standard-sized console will likely be large enough to block off an alcove entirely rather than just provide privacy. Finding custom office furniture isn’t possible in many towns and cities, where options can be limited. However, custom Dallas home office furniture is easily found. The craftsmen at Unruh Furniture make heirloom quality furniture for the living room, dining room, bedroom, and the office. You can visit Unruh Furniture’s Dallas showroom select the furniture that offers everything you need in a home office, and feel the quality of the fit and finish for yourself. Moreover, the craftsman at Unruh customize their pieces, and you can customize your Dallas home office furniture with the hardwood, finish, and dimensions that fit your home office and your lifestyle. At Unruh Furniture, we build custom office furniture in the hardwood, size, and finish that perfectly suits your home office. When you ask us to create your furniture, you not only get an heirloom quality piece made to fit your taste and lifestyle, you also get a lifetime warranty that will protect your pieces. Schedule a visit to our Dallas showroom in the Arts District to pick out your home office furniture today. Image 1: A Mid-Century Desk can be customized to fit your space. Image 2: An elegant Manchester Sideboard is a great way to store files and records.